Noise radiation from air conditioning ductwork is a persistent problem, particularly at low frequencies. This phenomenon is often called "rumble" and is caused by vibrational excitation of the duct walls, either by internally propagated system noise or by airflow turbulence, and resultant acoustic radiation. Rumble from ductwork can cause annoyance where ductwork passes over, or through, occupied internal building spaces. 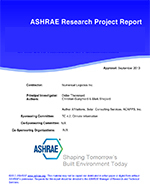 Clearly, the HVAC Engineer involved with acoustical design should have at his disposal some means of estimating duct noise radiation, yet the current ASHRAE Handbook contains no quantitative prediction scheme. A need therefore exists to formulate appropriate design methods and recommendations for noise radiation from air conditioning ducts, for use by HVAC Engineers. The objective of this research project is to fulfill the need for a design scheme, and also to provide experimental data and theoretical models which will give insight into the physical processes involved in acoustic noise transmission through the walls of air conditioning ductwork. The question of airflow excitation of the duct walls is not dealt with in this report, since it is generally considered to be of lesser significance than acoustic excitation. Although the original intention in this research project was to concentrate on low frequency noise transmission through duct walls, it transpired that both experimental and theoretical data were generated over the entire frequency range of interest in HVAC applications, and so the low frequency restriction was removed. The research investigation reported here embodies a rather detailed experimental and theoretical study of internal/external sound transmission through the walls of unlined air conditioning ducts of rectangular, circular and flat-oval geometry. The effects of various complicating features such as "cross-breaking" on the duct walls and an internal/external static pressure differential have also been examined. Both field and laboratory tests were carried out, and new methods of laboratory testing were devised in the absence of any standard test procedure.